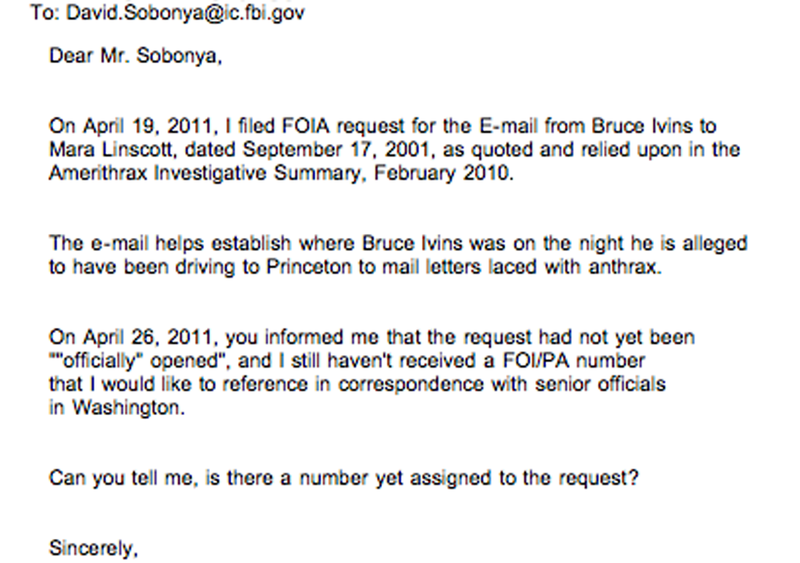 * FBI failure to produce documents under FOIA: April 19, 2011 FOIA for Ivins’ E-mail to Linscott on Sept 17, 2001, as quoted and relied upon in the Amerithrax Investigative Summary, February 2010 « CASE CLOSED … what really happened in the 2001 anthrax attacks? 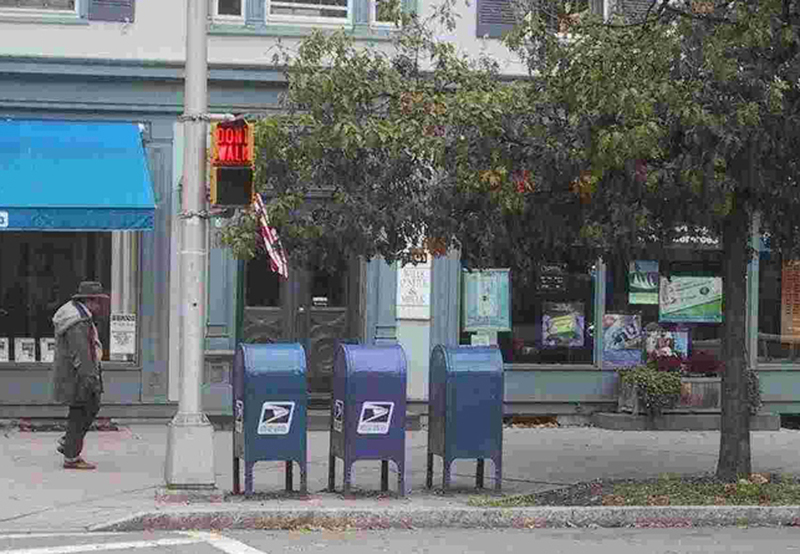 mailbox in Princeton, NJ ... the FBI has produced no proof that Dr. Ivins was ever there! This entry was posted on June 5, 2011 at 2:13 pm	and is filed under Uncategorized. Tagged: *** 2001 anthrax attacks, *** Amerithrax, *** Dr. Bruce Ivins, *** FBI anthrax investigation, fbi withholds documents, FOIA requests & anthrax, Ivins' E-mail to Linscott on Sept 17 2001. You can follow any responses to this entry through the RSS 2.0 feed. You can skip to the end and leave a response. Pinging is currently not allowed. The day that Dr. Ivins was busy cleaning his workspace as directed by Dr. Worsham, he also wrote Mara LInscott in an email being withheld by DOJ. The FBI has failed to produce the emails from Bruce Ivins to Mara Linscott (e.g., dated 9/15/2001 and 9/26/2001). These emails withheld by DOJ chronicle how he spent his time — AUSA Lieber’s failure to produce the documents about his work at the job with the rabbits — and his personal leave involving obligations relating to his daughter — needs to be scrutinized by GAO. For example, in the redactions of the September 17, 2001 to Mara Linscott in response to an email from her that day (DOJ withheld the email for years), DOJ specifically redacted the reference to how he was going to be spending his time that afternoon on September 17 — when DOJ speciously allege he was making preparations to mail the anthrax letters. Mara Linscott was deposed in this matter and may be one of several sealed depositions. The DOJ, if it stood for justice in this matter, would promptly produce the September 17, 2001 email under FOIA. The GAO needs to probe the issue of DOJ’s failure to comply with FOIA and its withholding of documents from the NAS. When it takes the United States Department of Justice 4 months to assign a number to a FOIA request going to establishing the timeline for Dr. Ivins on the day that the DOJ speculates, without basis, he mailed the anthrax, there is little reason to think the United States can be kept safe from attack by the DOJ. For years, FBI Director Mueller, Deputy Director Comey and investigative head Lambert — according to David Willman — were all fixated on Dr. Hatfill because of the bloodhounds that alerted to Steve Hatfill and Patricia Fellows. The head of the DC Field Office Mr. Persichini spoke at the conference announcing in August 2008 the conclusion that Dr. Ivins was responsible for the anthrax mailngs. When FBI Director Mueller and Agent Persichini presented the documents to the families, why didn’t they provide them the documents from September/October 2001 reflecting the reason Dr. Ivins was in the lab? Under any interpretation, they are highly relevant. As an experienced prosecutor, Director Mueller would know this. Had he seen them? Agent Persichini was sent the answers to the exam by a lawyer. Who was it? The main Amerithrax AUSA was occupied about a different major case and distracted from Amerithrax. The FBI’s work is too important to distract it for long from keeping our country safe over an open book exam. But in looking forward, it is important that the GAO and OIG ensure that the FBI understands the rules that apply to FOIA. And that there is no further cheating by the wrongful withholding of documents. The lab notebook pages needed for an informed consideration were withheld until May 11, 2011 and then produced only by the US Army. GAO should probe why these lab notebook pages were withheld given their obvious relevance. In regard to the September 17, 2001 email from Dr. Ivins to Mara Linscott , the US Army (after extensive checking) denies was written on Ivins’ work computer as AUSA Lieber claimed in the Investigative Summary. That email would help establish the time on 9/17 for Dr. Ivins’ whereabouts. We know for example that he went to his usual scheduled group therapy session in the early evening on 9/17 (see Saathoff report) and reported to work at 7 a.m on 9/18. His family provided an alibi for him in their respective interviews — all three lived in the same small house as Dr. Ivins. (It related to events 7 years earlier). The time the one quoted email was sent — along with any other emails sent that day that the DOJ is withholding — will help create the precise timeline during the period the DOJ speculates that Dr. Ivins traveled to Princeton.